NEEM ice core drilling project / www.neem.ku.dk. A photo of the main dome. Ice-core science is incredibly important, because it can help us understand how climate changed in the past  and how it might change in the future. It's also, as the participants in the North Greenland Eemian Ice Drilling (NEEM) project will tell you, incredibly fun. Where else can you snowmobile all day across some of the finest piste in the world, carve 200-year-old ice cores in a polar cave that would make Superman swoon, and relax at night (night being relative, since the sun never sets during the Arctic summer) with copious amounts of Carlsberg beer delivered to you by the U.S. Air Force? They didn't tell us it would be like this back in high school biology class. Getting out to the NEEM project site  on the northwest slice of the Greenland ice cap, some hundreds of kilometers from anything  was less fun. Our ride was a Hercules C-130 cargo plane, which also delivered provisions to the camp, as air travel is about the only way to get on and off the ice cap. It was scheduled to depart Kangerlussuaq at about 6 a.m., which required our group to be out of the hotel by 4:30 in the morning. Getting up at 3:45 a.m., I experienced something entirely new after seven years of international reporting: yo-yo jet lag. Two days ago, I flew six time zones ahead from New York to Copenhagen, then four time zones back to Greenland yesterday. Add in the fact that the sun doesn't set here, and my body thinks it's about 11 p.m., July 23, 1998. Our early wake-up call wasn't quite necessary  our flight out was, of course, delayed by an hour. Ice-cap flights have an on-time record that makes United's look meticulous, but at least there's an excuse here. Weather in Greenland is changeable, and even in the summer, hardly perfect for flying. It's not unusual for flights to be delayed for hours, even canceled altogether, sometimes stranding people on the ice cap for days at a time. We were lucky  our plane did depart, and landed safely at NEEM some two-and-a-half hours later. There's no paved runway on the ice cap, just a groomed, flat snow path, and the planes don't use landing gear but giant skis. That can make takeoff tricky, if snow has melted and stuck to the skis. After dropping us off, our plane taxied around the skyway for more than an hour trying to reach escape velocity, and finally had to dump 3,000 lbs of garbage it was meant to ferry back from NEEM. The ice cap is white, blinding and endless. At NEEM we're 77 degrees latitude north of the equator and nearly 2,500 meters above sea level, all of it accumulated snow and ice  some 130,000 years worth, which is what the scientists at NEEM eventually hope to drill through. The polar horizon stretches to all sides without landmarks, save for the black and red flags that mark the boundaries of the camp, the red sleeping tents and the heated main dome, a geodesic wooden structure that is the kitchen, conference center and overall heart of NEEM. The result is scary, when I ponder how tiny and isolated I am against this vast sheet of ice, a white void without plants, animals or even rocks. It's also really, really cool. But there's no shortage of work to be done. 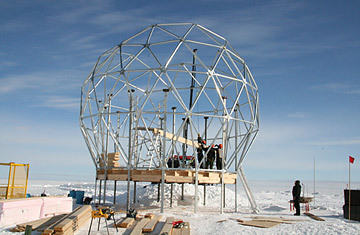 A kilometer and a half outside the main camp, Sigfus Johann Johnsen and Steffen Bo Hansen drill for shallow ice cores. This is a side project, a much smaller drill that can bore down 70 m or so below the surface, which covers the past few hundred years of climatic history. At this depth what they bring back is not solid ice, but a half-snow, half-ice substance called firn. It's solid but porous, so it can trap some of the gas present in the atmosphere when it accumulated as snow. They can tell how much carbon dioxide was in the air during a given time period (roughly seven years with each layer, because in the porous firn  unlike the frozen ice below  air from different years can mix over time), and by analyzing oxygen isotopes inside the firn, they can tell the temperature as well. Johnsen and Hansen bring a core to surface, through a hole 60 m deep  it's a bit like ice fishing. What comes out of the driller is brilliant and glistening in the Arctic sunlight, crystalline. It's solid history, and beautiful too  with spares cores, the NEEM scientists have built an ice palace next to their drill. From there, the ice cores are taken to the "cold room," a hollowed out cave about 6 m below the surface, where drillers will carve the cores in sections, to be bagged, tagged and eventually flown back to the Center for Ice and Science in Copenhagen, where they will be fully analyzed. The work is done underground to make sure the ice stays stable  though we're far above the Arctic Circle, with the open sun the temperature is only -6 degrees or -7 degrees C, though the wind can make it feel worse on the open snow. The sprawling cold room is also where the main drilling at NEEM will be done. That won't take place until next summer, but the scientists have already dug out a deep trench where the main drill will bore to the bottom of the ice. Here the cores will be pure ice, inside which gas will be trapped in tiny bubbles  air from over 100,000 years ago. Pulling up those cores will take three years, longer to fully analyze the ancient gases found inside them. In the meantime, there's dinner  massive steaks, potatoes and salad  and beer, which comes in 5 liter Heineken mini-kegs. Jimi Hendrix and Dr. Dre are playing on the stereo in the main dome. NEEM has no shortage of grad students like Trevor Popp, who describes himself as "34 going on 12," and they know how to have fun. Don't get me wrong. Ice-core science is all hard work  especially the painstaking analysis of the ice cores back in the lab  but only a certain kind of scientist chooses to spend weeks on an isolated ice cap, and I suspect that kind of scientist is a lot more fun to hang out with than the sort that never leaves their laptops. They're spiritual descendants of the polar explorers who crossed the ice over a century ago with dogs and sleds and little else, who  as Rajenda Pachauri, the chairman of the Intergovernmental Panel on Climate Change and one of our traveling group, says  "never knew whether they'd come back alive." Sometimes it can seem that a sense of adventure has been lost by modern science. Not by people at NEEM. After a series of post-dinner presentations, we drink whiskey cooled by ice cubes cut from some of the spare cores, dating back to 1816 exactly. One by one we head off to our assigned sleeping tents, bunk bags and bags, where the air is only a little warmer than it would be outside. I suppose my body clock has caught up with wherever I am, because I fall asleep immediately, and deeply. I wake up once in the middle of the night to use the bathroom, and stagger outside, shivering. It's 2 a.m., and the sun is bright.